Flukes and flounders look very similar so it’s difficult to tell them apart. Both belong to a family of flatfish that dwell at the bottom of the sea. Both are easy to catch and are known for their tasty meat. 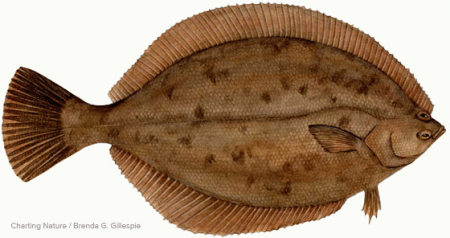 However, if you look closely, flukes and flounders are actually very different. In what ways? The difference between the two will be discussed in this article. A fluke, scientifically known as Paralichthys dentatus, is a kind of flatfish that belongs to the flounder family. It is also known as the “left eye fish” because its eyes are on the left side of its body. It has eye-like spots on its body and has the ability to hide by blending in the environment. Its sharp and well-developed teeth are visible because of its large mouth. In some areas, a fluke is also widely known as a “summer flounder” because it is abundant during the warmer months of the year. Upon reaching adulthood, a fluke can weigh up to 20 pounds and can grow up to 20 inches long. Females are generally larger than males. It has an average lifespan of twenty years. A mature fluke is an aggressive predator and mainly preys on fish. Although a fluke is a bottom dweller, it is capable of swimming and is even able to reach the surface to hunt for food. Fluke meat is smooth and firm so it is perfect for sushi and sashimi. A flounder is a generic name that refers to five types of flatfish in the Pleuronectidae suborder: Bothidae, Pleuronectidae, Achiropsettidae, Paralichthyidae, and Samaria. However, it is more widely used as a common name for Pseudopleuronectes americanus or the “right eye fish.” It is named “right eye fish” because its eyes are on the right side of the body. In some areas, it is also known as the “winter flounder” because of its abundance during the winter. The mouth of a flounder is noticeably small and does not extend beyond its eyes. Its teeth are not visible. Upon reaching maturity, it can weigh up to 5 pounds and can grow up to 18 inches long. A female flounder may live 14 years while a male flounder may live up to 12 years. Flounder has tender and rough meat, which is also called “lemon sole” in the U.S. It is perfect when deep-fried or braised. Aside from its delicious meat, the winter flounder is also coveted for its roe (eggs). What, then, is the difference between a fluke and a flounder? A fluke is scientifically known as Paralichthys dentatus and is also called “summer flounder” because it is abundant during the warm season. On the other hand, a flounder is scientifically known as Pseudopleuronectes americanus and is also called “winter flounder” because it is easy to catch during the colder months. The term “flounder” is also a common name that refers to five species of flatfish, including a fluke. Therefore, a fluke is a flounder, but not all flounders are flukes. In terms of appearance, a fluke’s eyes are on the left side of its body, whereas a flounder’s eyes are on the right side of its body. A fluke has a large mouth and visible, well-developed teeth, while a flounder has a small mouth with no visible teeth. A fluke can weigh up to 20 pounds and can be as long as 20 inches, while a flounder can weigh up to 5 pounds and can grow up to 18 inches. Both have delicious meat. However, fluke meat is smooth and firm while flounder meat is tender and rough. Fluke meat is perfect for sushi and for recipes with similar preparation, while flounder meat is best fried or braised.